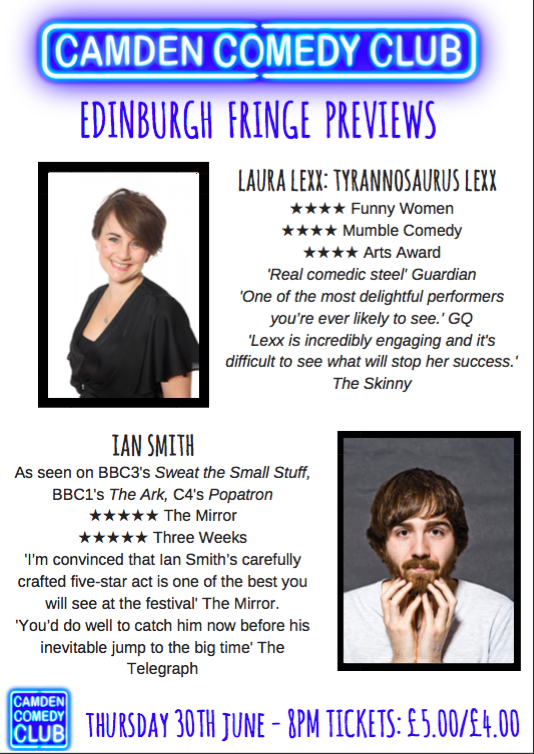 TICKETS: http://listings.camdencomedyclub.com/events/30-jun-16-edfringe-previews-laura-lexx–ian-smith-camden-head/Superb stand up from LAURA LEXX and IAN SMITH, presenting their brand new Fringe shows. Laura Lexx returns with her second hour, following on from the success of “Lovely” with the follow up show “Lovely Wife”. No points for guessing what happened between shows. In this markedly more mature and broadly scoping show, Laura explores themes of identity in womanhood as they are altered by marriage, children, physical appearance alteration and work defining oneself. If this all sounds a bit heavy, just remember a lot of this will be explained with the use of penguins and cake. Award-winning comedian Ian Smith (BBC3’s Sweat the Small Stuff, BBC1’s The Ark) returns with a work-in-progress of his fourth solo show. “I’m convinced that Ian Smith’s carefully crafted five-star act is one of the best you will see at the festival” The Mirror. “You’d do well to catch him now before his inevitable jump to the big time” The Telegraph.